Imago Dei means the image of God. 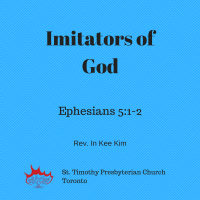 Let us hear the word of the Lord, Ephesians Chapter Five verse 1 to 2 “therefore be imitators of God as beloved children and live in love, as Christ loved us and gave himself up for us a fragrant offering and sacrifice to God”. This is the word of the Lord, thanks be to God. Imago Dei, means the image of God. This implies that we human beings are created in God’s image. Meaning we have God’s image within us, each individual, each person has God’s image within them. I think it is very important to understand this, to understand Christian ethics and Christian living because of this theory. Through this theory of basic belief, we consider every human being precious and we uphold their dignity. We oppose any kind of corruption and the abuse that takes away this basic human dignity. The slavery system in human history, the kind of racism their descendants receive in the United States, sexual discrimination and what happened in Las Vegas. We don’t condone these, believing that they opposed our belief that all human beings are created equal in God’s image. When we understand that we are created in God’s image, the way we treat each other changes. We’ll treat others with respect and affirm their dignity with our mouth, with our behavior, with our attitude. We treat each person with dignity. That’s what we do. Jesus came to this world to restore the image of God in each person, that’s what Jesus came to do. Saint Paul told us to be the imitators of God. In other words, being imitators of God, meaning find God’s image within us. You have to know that you have God’s image within you. As beloved children of God, Saint Paul told us to be imitators of God. As we accept that we are God’s beloved children, our Imago Dei is restored within us. When we deeply experience God’s love within us, then we can see the beautiful image of God within us. Then self respect will be restored and this is the very basic thing that the Bible teaches us. Let me say one thing very important for you to remember this morning or this afternoon. We do not have dignity because I am useful, we have dignity because we have God’s image within us. We don’t have dignity just because we are useful. We have dignity because we have God’s image within us. This is a very important statement. We need to affirm this because this is not affirmed in the world we live in. We give dignity to the people who are useful, but we don’t affirm the dignity for the people who we think are not that useful. When Jesus came to this world, he saw that the useless people were treated badly. These useless people, they said not only are they useless, but they are sinners. They said they were dehumanized. They were labelled as sinners simply because they were useless in their eyes. The lepers, the lame, the blind. All of these people were considered as sinners. When you read the Acts of the Apostles, Peter and John went to the temple and when they were about to enter into the temple at the gate, there was a lame sitting down asking for money, begging for money, and Peter and John said this, “I have no silver or gold, but what I have I give you in the name of Jesus Christ of Nazareth, stand up and walk” and this lame was able to stand up and walk. Do you know where he went? First? After he was healed?, he was leaping for joy and entered into the temple. Why? Because he was sitting in front of the temple, but he could not enter into the temple because they said “you are a sinner”. He could not even approach God because they considered them totally useless. They ignored and disrespected the useless people. They saw them as a waste, waste for the society, but Jesus was different. Jesus saw Imago Dei within them, not because they were useful, but because Jesus saw the imago Dei within them. Jesus honoured their dignity. Today is the 500th anniversary of the Reformation and it is also the 21st anniversary of our church. Our church anniversary always falls on the Reformation day, so it has some significance and meaning for this church. On October 31st 1517, the reformer, Martin Luther started the Reformation. He saw the corruption and the exploitation of the Church. The Church had lots of power, but with that power, they took away the rights of the people. Each person’s dignity was not respected. He saw that the church was just an institution and each person was simply used to strengthen the institution. They didn’t know that the people, were the Church. The church did not see each person with a beautiful image of God. Now, 500 years later, we need to restore our church. We need to have reformation for the reformed churches, Protestant. Restoring church means each person’s dignity should be restored. I see a lot of churches just using people as a tool to make the church bigger and bigger. All the mega churches movement, we don’t see Imago Dei in each person. They don’t treat them in that way. When we have the Imago Dei restored within us, we can see the beautiful image of God in other people. Then we can treat each other as though we treat God. The way we treat each other should be changed, just because I have the power, just because I’m smart, we cannot treat those who don’t have the power and intelligence and capability with content. That is not the right thing to do. Yes, we need power to maintain the society. We need power to protect ourselves from chaos and disorder. We need power to control those who abuse the power. We need power to coexist, but this power can not be abused. To take away the image of God in people and dehumanize them. We fight in every way against this kind of attitude because it is against the spirit of Imago Dei. It’s against our belief. When I look at the modern world, I see the power controlling everything. People are obsessed with power. We’re not much different from the society Jesus came to, if not worse. Jesus saw that the Imago Dei was gone in people’s minds and he saw only the raw power controlling the world. Huge Roman power and huge Jewish power, clerics religious power. So Jesus made a whip and chased the money changers. Once people came to Jesus to test Jesus and they said, “should we pay the tax to Caesars?” because Caesars controlled the Israel. Jesus did not answer their question, but Jesus challenged them with something else. Jesus told them, bring your coin and they brought the coin and he let them see it, “what image do you see there?” and they said “the image of Caesar” and Jesus said, “give therefore to Caesar the things that are Caesar’s and to God the things that are God’s”, in other words see yourself. What image do you see everyday? What image do you see within yourself? Image of Caesar or image of God? Let us see what image we see within ourselves. Is it the image of power or the image of God? I pray that Imago Dei may be restored within us. I pray that Imago Dei may be restored in this world. The materialism replaces the Imago Dei within us with the image of money. Danielle you’re going to South Africa, you will see a lot of irony. You went there once, but you’re going again. I’ve been there more than 10 times. In our area, just one room a whole family lives, no running water and no washroom. You drive five minutes, you will see Eaton Center right there in South Africa. Still the living standard between white and black are radically different. You’ll see how much people are damaged. You will witness that. I hope that you witness Imago Dei in each person. To restore the Imago Dei Jesus gave himself up for us, a fragrant offering and sacrifice to God within Jesus. There was Imago Dei. That’s why Saint Paul said, “let us see” in their case the God of this world, the God of this, I don’t know what it is, money, power, whatever. The God of this world has blinded the minds of the unbelievers to keep them from seeing the light of the gospel of the glory of Christ. Who is, Imago Dei. Who is the image of God. Jesus saw the Imago Dei within himself and he saw the Imago Dei within others. That was his life, let us deeply meditate on his life so that our own Imago Dei within us may be restored.